Saturday 14 February: Raetihi Y Block AGM, 11am, whānau campsite, Makaranui/Toanui. Thursday 19 February: Ngā Tangata Tiaki (Te Awa Tupua) roadshow, Mangamingi Pā, 6pm. Ngā Tāngata Tiaki o Whanganui is holding hui in February and March to discuss the Te Awa Tupua settlement, the forthcoming election processes and related initiatives. Saturday 21 February: Uenuku Charitable Trust BOT hui, 1pm, UCT office, 156 Seddon St, Raetihi. Sunday 22 February: Te Rūnanga o Te Awa Tupua hui for hapū who wish to participate in this body. Raetihi Pā, 10am. Saturday 14 March: Uenuku Charitable Trust BOT hui, 1pm, Raetihi Pā. Sunday 15 March: Taurewa Forest shareholders hui, 11am, Raetihi Pā. The next Board of Trustees hui will be on 21 February at 1pm, at 156 Seddon St, Raetihi. The date of the next Uenuku Charitable Trust board of trustees hui has changed from 10 January to 17 January, at 156 Seddon Street, Raetihi, at 1pm. The next Uenuku Charitable Trust board of trustees hui will be held on 10 January 2015 at Raetihi Pā at 1pm. Tēnā rā koutou i roto i ngā mihi o te wā, me te tau hou e mahuta ake nei i tōna pae. Kia tau ngā manaakitanga a te wāhi ngaro ki runga ki a koutou ko tō whānau. Mēri Kirihimete me ngā mihi o te tau hou. Uenuku Charitable Trust wishes us all a safe and happy Christmas and New Year. Thank you, whānau, for your support. E ngā reo o te whenua waiwaiā mai i te Kāhui Maunga ki Tangaroa, whakarongo mai ki te reo iti nei e pā ana ki ngā mahi a ngā hapū me ngā mahi a te iwi. Tēnā Koutou and welcome to the third edition of Uenuku Iwi Update. The Uenuku board of trustees is delighted to bring you this edition of our regular newsletter, which aims to keep you informed and updated on our organisation, our work, our community and upcoming events. The next and last UCT hui for the year will be on Saturday, December 20, at 1pm, Raetihi Pah. Following the hui, we would like to celebrate getting through the year! Please bring a plate of kai and plenty of Christmas cheer. All welcome. Whakapapa and waiata wānanga at Rehua Marae, Christchurch. Friday, 28 November, 7pm start until Saturday afternoon. $10 toward cost. Naumai haere mai, Raetihi / Uenuku whānau living in Christchurch. Congratulations to Rayma Bryers and Harley Turoa, who have been appointed trustees to the Board of Uenuku Charitable Trust – Rayma as uri representative for the upper North Island, and Harley as hapū rep for Atamira. Congrats also to trustee Caroline Heta, who has been appointed to represent our South Island uri. Caroline will liaise with our Uenuku uri co-ordinator in the deep south, Sonny Tonihi, to help strengthen communications and connections with our whānau in Te Wai Pounamu. Welcome aboard, whānau. An Uenuku board of trustees hui will be held on Sunday, 7 December, at Makaranui papakainga at 1pm. Closing submissions were heard by Judge Layne Harvey in the Rangipō North 8 hearing at Waiouru on Monday, 17 November. Uenuku uri Aiden Gilbert, Rangi Bristol and Matiu Haitana applied to the Māori Land Court to have Uenuku interests recognised in the Rangipō North 8 block and Rangiwaea Tāpiri. An Uenuku board of trustees hui will be held on Sunday, 16 November, at Raetihi Pā at 11.30am. Rangipō North 8 hearing resumes, Waiouru, Tuesday (5pm start) & Wednesday. Uenuku application before Māori Land Court to recognise Uenuku interests on Ruapehu. Nau mai, haere mai ki te tautoko tēnei kaupapa whakahirahira. An Uenuku board of trustees hui will be held on Sunday, 28 September, at Raetihi Pā at 11am. The Ngāti Tara committee hui scheduled for Saturday, 27 September, has been postponed. Uenuku skiers and snowboarders have taken the Aotearoa Iwi Snow Championships for primary and secondary schools. Uenuku was named the overall iwi champion after both its primary school team and its secondary school team won their individual championships on Ruapehu yesterday (Monday, 8 September). Many Uenuku individual competitors also won their events or were placed in the top three. Yesterday’s successes follow on from a gold medal at the North Island Primary School championships last week, when the Raetihi School Snow Academy was named the best snowboard team in the motu. A week earlier, the school’s skiers competed and were successful in moving up their rankings significantly. Look out for a full report in our Uenuku Charitable Trust newsletter, due out soon. Ka wani kē, tamariki mā. Wetiweti kē koutou. Congratulations from Uenuku Charitable Trust. Uenuku is proud of you all. AOTEAROA IWI SNOW CHAMPS – Official Results – Fastest Primary Skiers: 1st – Waimarie Akapita (20.50), 2nd – Michaela Sinai (22.57), 3rd – Noah Harto (23.53). Fastest Primary Snowboarders: 1st – Tui Wikohika (25.65), 2nd – Eli Brown (31.43). Fastest Secondary Skiers: 1st – Simon Katene (19.08), 2nd – Lucy Brown (19.94), 3rd – Hayze Pehi (20.52). Fastest Secondary Snowboarders: 1st – Johnny Double (22.65), 2nd – Catherine Pakai-Dewes (25.95), 3rd – Richard Shanks (28.67). Fastest Open Skiers: 1st – Duane Dixon (19.03), 2nd – Ted Barham (22.04), 3rd – Marama Akapita (31.39). Fastest Open Snowboarders: 1st – Aiden Heketa (24.47), 2nd – Tarake Mareikura (26.16), 3rd – Rakei Hina (26.29). Snowboard Slopestyle Champs: 1st – Tuhirangi Akapita, 2nd – Johnny Double, 3rd – Elijah Brown. Ski Slopestyle Champs:1st – Te Kaokao Kairimu, 2nd – Michaela Sinai, 3rd – Tuaatea Akapita. Champion Primary School Team: Uenuku – total team points of 115. Champion Secondary School Team: Uenuku – total team points of 61. Champion Open Team: Atihau-nui-a-papa-rangi – total team points of 134. Uenuku uri Lisa Warbrick has accepted the role of Uenuku Charitable Trust registrar and will be responsible for all aspects of registrations. Her appointment is effective immediately, subject to police vetting, a conflict of interest declaration and a confidentiality declaration. The position is voluntary.This appointment recognises the importance to Uenuku of building a robust database of registrations, and ensuring that all registrations are correctly completed, signed and able to withstand scrutiny. Lisa will pro-actively manage the drive for Uenuku registrations and ensure the database is managed and securely held. Congratulations, Lisa, and welcome aboard. Makaranui papakainga marae (not far past Mangamingi Pā as you head to Ohakune, on the left-hand side). 11am, Sunday. Following a request from our Ngāti Tara/Ngāti Tamakana whānau, an Uenuku roadshow presentation will be held at Makaranui papakainga on Saturday 30 August at 6.30pm. All welcome. Please bring a plate for supper. Karanga mai ngā hapū o Patutokotoko mō te tū o ngā mana taua i te Taniwha o te awa o Whanganui. Following the Taurewa Forest hui at Raetihi Pā on August 9, a wānanga will be held to allow for further discussion around settlement issues. The wānanga will start at 5pm on Friday, 12 Sept and end at 4pm on Saturday, 13 September, at Raetihi Pā. There have been many, many requests for the kupu for the waiata introduced at our Uenuku roadshow presentations throughout Aotearoa over the past month (July 2014). Anei ngā kupu. Saturday, 9 August 2014: A hui will be held at Raetihi Pā this Saturday at 10am to discuss returning the Taurewa Forest Settlement to Uenuku iwi, and to progress the settlement. Uenuku Charitable Trust is calling for the return of this settlement to Uenuku, where it rightfully belongs. The hui has been well advertised and all Uenuku whānau, hapū, uri are urged to attend – strong backing from the iwi will support the kaupapa. Sunday, 10 August 2014: Uenuku hui-ā-iwi in Whanganui, 2pm, Tūpoho Community complex, 97 Bell St, Whanganui. Uenuku Charitable Trust is holding hui-ā-iwi to inform Uenuku iwi about the work it is doing. The Trust will present information to update whānau on its work to date, and on opportunities to become a board member. Monday, 25 August and Tuesday, 26 August 2014: Rangipō North 8 hearing at Ohakune. Powderhorn Chateau, 194 Mangawhero Terrace, Ohakune. Uenuku uri will present new evidence before the Māori Land Court to have Uenuku interests recognised. 10am start. Nau mai, haere mai ki te tautoko ēnei kaupapa whakahirahira. Uenuku Charitable Trust is holding hui-ā-iwi to inform Uenuku people about the work it is doing. We urge all whānau who live in the Whanganui area to attend. The Trust will present information to update whānau on Uenuku Charitable Trust, its work to date, and opportunities to become a board member. Nau mai, haere mai. Please bring our kaumātua and rangatahi with you, and pass on this notice urgently to all your whānau networks. A reminder that Uenuku has its Auckland hui-ā-iwi this Saturday at 1pm, followed by the Hamilton hui-ā-iwi on Sunday at 9.30am. Nau mai, haere mai whānau. We look forward to catching up with you all. Uenuku Charitable Trust is holding hui-ā-iwi to share information about hapū and iwi developments in and around Ruapehu, Manganui-a-te-ao, Whanganui, Tongariro National Park, Waimarino, Raetihi. We urge all whānau who live in the Auckland area to attend. Whānau from Raetihi will present information to update whānau on Uenuku Charitable Trust, its work to date, and opportunities to become a board member. We urge all whānau who live in the Hamilton area to attend. Whānau from Raetihi will present information to update whānau on Uenuku Charitable Trust, its work to date, and opportunities to become a board member. Uenuku Charitable Trust is holding hui-ā-iwi to share information about hapū and iwi developments in and around Ruapehu, Manganui-a-te-ao, Whanganui, Tongariro National Park, Waimarino, Raetihi, Mākaranui. We are asking all whānau who live in the Wellington area to attend. A small contingent of whānau from Raetihi/Makaranui will be presenting information to update whānau on Uenuku Charitable Trust, its work to date, and opportunities to become a board member. Please bring Pot Luck lunch to share. Please bring our kaumātua and rangatahi with you, and pass on this notice urgently to all your whānau networks. Uenuku Charitable Trust is holding hui-ā-iwi in Christchurch and Gore next weekend to share information about hapū and iwi developments in and around Ruapehu, Manganui-a-te-ao, Whanganui, Tongariro National Park, Waimarino, Raetihi, Makaranui. We are asking all whānau who live in the South Island to attend one of the hui-ā-iwi. A small contingent of whānau from Raetihi/Makaranui will be presenting information to update whānau on Uenuku Charitable Trust, its work to date, and opportunities to become a board member. Please bring our kaumātua and rangatahi with you, and forward this notice urgently to all your whānau networks. Kia ora whānau, can you please forward this pānui onto all Tukaiora uri. A Hui-A-HAPU has been called at Makaranui Marae/Papakai this Sat 7th June 2014 for uri who are interested to represent Ngāti Tukaiora Hapū onto the new iwi entity (Uenuku Charitable Trust). Clyde Tukaiora Connell has sought permission and support from our kaumātua to put up Ngāti Tukaiora Hapū onto the new entity and has put his name forward as a nominee. If there are other interested nominees please attend the hui. Calling all whānau and hapū o Uenuku mai i te Kahui Maunga ki Tangaroa. KAUPAPA: To register all Uenuku uri here online. WHY? 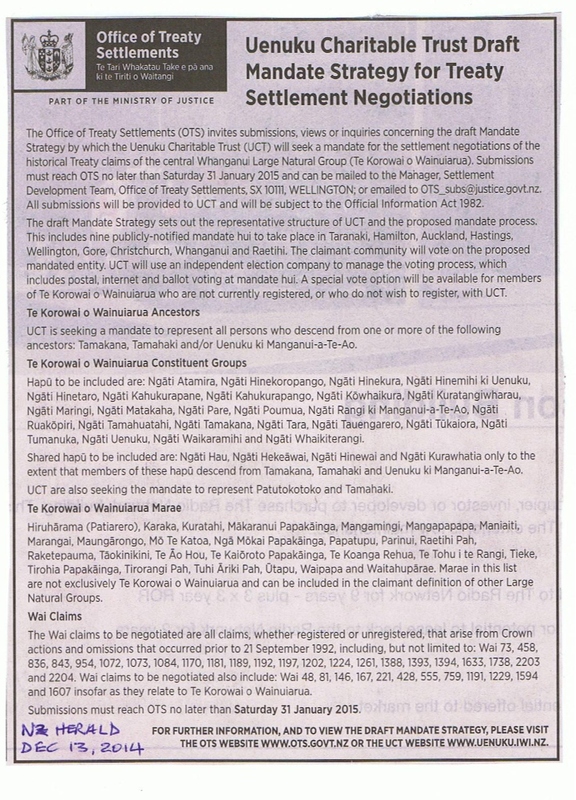 To connect and keep all iwi, hapū and whānau informed on progressing Uenuku Treaty Settlements. HOW? Just click on Registrations. You can also follow all the News by liking our Facebook page and Twitter account – Links to the right. Enter your email in the Subscribe area (again to the right) you will receive all the news as soon as it is posted on the website direct to your email account.